Editor's Note: Trustees Gard Jameson and Richard Keeler attended this event that inaugurated the new Urantia Book Los Angeles Association of Urantia Association International. They came from California, Illinois, Indiana, Nevada, Oregon, Quebec, Wisconsin, and Wyoming. 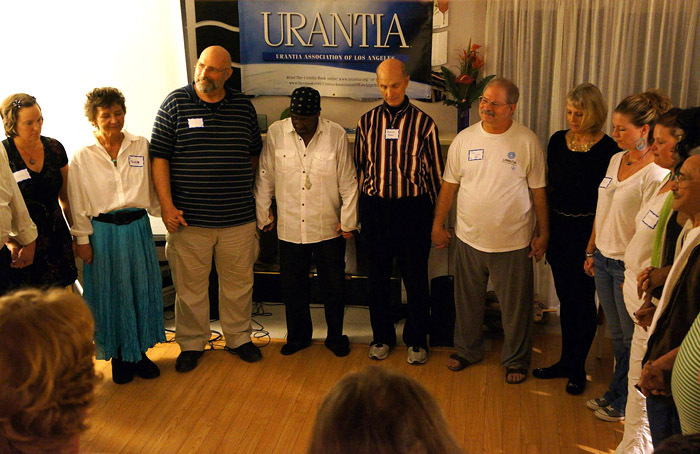 It was a beautiful Friday evening in Santa Clarita, California, which is just north of Los Angeles, when some forty persons gathered for a community introduction to The Urantia Book, which was followed by a performance by Grammy-nominated, music sensation, and Urantia Book student, Pato Banton. The primary purpose of the two-day gathering was to have a Urantia Book mini-conference and to install the latest association of the Urantia Association International. Attendees learned about the event from emails, Facebook postings, and flyers posted at the local community college and businesses in the area. On Friday evening I, Will Sherwood, began with my presenting a PowerPoint introduction to The Urantia Book based on a presentation made several times by Andrea Barnes, who lives in the San Diego area. A personal introduction and a brief overview of my religious upbringing. How I found the book and what my initial reactions were to it. My history of trying to tell people about the book. A brief overview of the four parts of the book. How the book came into being, why the origins are a mystery, and why the revelators wanted it that way. Why the book has not been publicized or commercialized. Why no one is making money off the book and how people have heard about it. Details that the only formal meetings are study groups are that the book is not a "bible" for a new church or religion. Ascending and descending Sons of God. Whatever else that comes to mind. What the book has done with me and for me. Opportunities for attendees to talk. Though all of us were surely enthralled with The Urantia Book, perhaps the greatest draw for the evening was the "rock the house" musical performance from Pato Banton, who got everyone dancing. After his performance, Pato encouraged the group to form a circle for a closing prayer. Everyone was encouraged to prayerfully or worshipfully express him or herself. It was a wonderful evening! Will Sherwood, Pato Banton, and Richard Keeler at the Urantia Book Los Angeles Association inauguration.